Each night when I go to bed I set my cell phone on the nightstand and wonder if it will ring during the night. Except last night; I just went to bed. I got “the call” at 12:45am and made it to Mom’s room as the ambulance crew was trying to figure out how to move her from the floor by her bed onto the transport. She was sound asleep, resting after taking a tumble, presumably on the way to the bathroom. We’ll never know what happened as she is unable to tell us, having forgotten what happened almost as soon as it did. Aides found her yelling for help during a room check. As soon as the paramedics attempted to move her onto a backboard to lift her onto the transport they got an earful of expletives. Mom has always been a colorful curser. There’s very little meat on her 98-pound frame. I’m sure the cold, hard plastic backboard was uncomfortable at best, and she let them know it. I rode with the ambulance to the hospital hyper-conscious of every pothole. We dodged the bullet this time. X-rays showed no broken bones. Mom slept through most of the ordeal, and I was home in bed again just after dawn. White at the ER she had her blood pressure taken once, got a shot, and tried to climb out of bed twice sticking both legs through the bed rails. Backing her up was no easy task as she was on a mission to complete the errand that landed her in this fun house in the first place. She used the bed pan twice, received a series of x-rays, and finally demonstrated that even at 4 am, awakened from a sound sleep, with morphine sloshing through her veins and people supporting her on both arms, that she could still ambulate proving that she could be discharged. Total time elapsed: 4 and 1/2 hours. I can’t wait to see the bill. Not a single person we encountered bothered to identify themselves to us. I still don’t know if the person who discharged us was the doctor or part of the cleaning crew. To keep Mom calm, I spoke to her very slowly and in an extra soft voice and asked the ER staff to do the same. No matter how well I modeled the desired behavior, nor how often I reminded them that her hearing was probably better than theirs, they insisted on speaking at such a ridiculously high volume it was almost comical. They did not take direction well. I gave up cooking, but I still like to eat. Kris Johnston took me to Walker Brothers for brunch on the way to the airport yesterday and suggested I order mini-version of their famous German Pancake called The Dutch Baby. Oh my goodness! Quoting from the menu, “it’s a thin and delicate plate-filling oven-baked pancake dusted with powdered sugar and served with lemon on the side.” It was as big as my head, a huge crater with 3″ walls, and filled with bananas and strawberries for only $2.95 additional. And light as a feather. I ate the whole thing. I’ve had mayonnaise on French fries (Holland) and salt on grapefruit (my husband’s favorite), but never lemon on pancakes. It was fabulous. Six great locations in metro Chicago. No, I don’t own stock but I’m considering it. I hear they have a mean Apple Pancake too, but I’m not messing with success. As JoAnne, Lisa, and I walked from the St John Vianney parking lot to the school’s front entrance it looked like a parade! Counting the dogs there were seven of us nose to tail along the sidewalk. 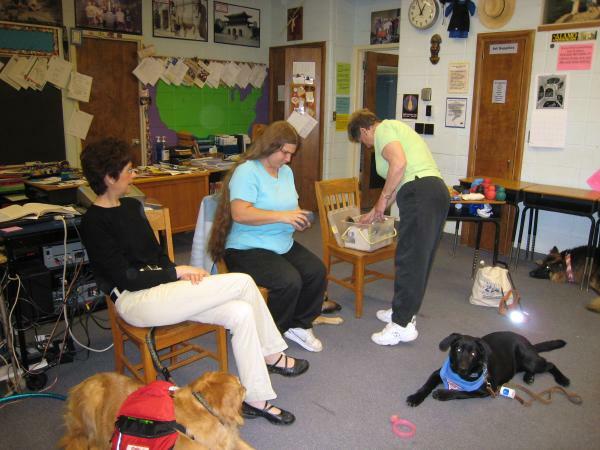 We were coming to talk about service dogs and how they can help people with disabilities. Lisa is a graduate from Leader Dogs for the Blind. She told my husband’s seventh grade students how her German shepherd, Abel, helps guide her safely wherever she needs to go. JoAnne is a Puppy Counselor from Leader Dogs for the Blind and she brought a 7-month old black lab/shepherd mix named Maggie May. She is the 17th puppy JoAnne has socialized in preparation for formal training at Leader Dogs for the Blind in Rochester, Michigan. If Maggie passes she will be given to a blind person and begin her career as a dog guide. JoAnne also brought Murray, a long-haired German shepherd who was “career-changed” because he has hip displasia, a condition that would negatively impact his ability to become a dog guide. Murray is now JoAnne’s dog. And, I brought Madison who is a semi-retired service dog for my mother. Here we are getting ready before the students come in. You can see furry Murray under the desk. He’s hiding. He’s 110 pounds and totally afraid of his own shadow. Abel is to Lisa’s left. You can just see his snout and left front paw. Maggie is in the middle of the room in a “down stay” as JoAnne prepares a display of safe and unsafe dog toys. Madison is waiting patiently for something to happen. We spent about 40 minutes with Mr Simms’ class. They just finished reading Hello, Goodbye, I Love You -The Story of Aloha, A Guide Dog For The Blind. I was going to start blogging months ago. But, every auspicious occasion to begin the blog somehow slipped by because I hadn’t quite figured out where I wanted to blog, IF I wanted to blog, or exactly how to blog. But, it didn’t matter because I didn’t have time to decide or act on my blogging impulse anyway. At least twice a day, I announced, “If I had a blog, I would blog about this.” But I didn’t, so I couldn’t. And now I do, and I’m not sure I can. I don’t have anything profound to say. Bloggers block. I had an EVENT yesterday. Today’s kind of boring so far. If I can change the date to make it look like I started the blog yesterday, I’ll write about yesterday. Then you’ll be impressed. Blogging reminds me of “Jump Rope.” (As in “Do you want to Jump Rope?”) No, I don’t. I hate Jump Rope. I do not excel at any sport and the terror of taking my turn in the schoolyard at recess almost made me hate recess. I’d wait, and wait, nodding my head like an inebriated pigeon with each swing, only to finally pick my moment to jump in and have the rope catch my shoe or smack me in the neck. I finally stopped playing Jump Rope and joined the AV Squad. (I was tall enough to carry a filmstrip projector without it dragging on the ground.) Proud moments. You can help me get over my blogging terror by swinging the rope really high. Let it hit the ground and then, once the rope stops moving, I’ll jump over it. If I am successful, I’ll try it again. I believe this translates into leaving me encouraging feedback. Together we’ll get the hang of this.